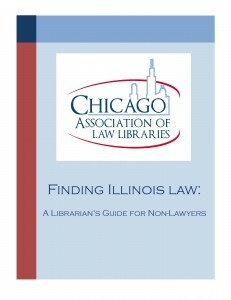 The CALL Government Relations Committee is proud to publish Finding Illinois Law: A Librarian’s Guide for Non-Lawyers. Recognizing that legal research is a specialized skill practiced by attorneys and law librarians, but that the general public often has a need to locate and understand legal information, the Committee presents this guide as a tool to aid non-lawyers. The guide is available for download (pdf) in its entirety and by chapter.